The leaves have begun to turn here in Michigan. It is faint, but noticeable. The mornings are much cooler, too. Fall is knocking on the door and I don’t want to answer. Since I was little, Summer has been my favorite season. It was exciting to be free from the confines of school and weather. To play outside. To swim. To dream. To read. To watch TV. I’ll miss feeling the breeze on my bare skin. Seeing the breeze move the leaves on the trees. Wearing shorts and t-shirts and not worrying about coats. Getting in my car and driving without a worry about darkness or snow. I’ll miss my empty dining room table and the silence that surrounds it. Soon enough, there will be arguments there about doing homework, crying while doing homework, and stress about trying to squeeze in homework. On the other hand, maybe I’ll find a new peace as my kids won’t be fighting with one another out of boredom so much! There is something magical about summer vacations that a vacation at any other time of year just can’t replicate. We went “Up North” as they say in Michigan and got lost fishing, boating, relaxing, sight seeing, and wine tasting (yum!). At least I can still taste wine in the winter, right? I work part-time outside the home, which has always been a terrific blessing. Each week this summer, I spent three days in the office and two days at home with my kids (plus weekends). I know some stay-at-home moms who are desperate for the kids to go back to school, but that’s not my reality. Those two days we have each week were–dare I say it?–fun. We went swimming. We baked cookies. We watched TV. We hung out with friends. We did whatever we wanted and it was good. As I send them back into the arms of the school system, it is with a bit of regret. These kids were MINE all summer and now I have to share them. And help with their homework! Guess I’d better pick up my chin and turn towards the deliciousness of fall – crisp days, beautiful leaves, Halloween, and pumpkin-spiced everything. What will you miss about summer? What is your favorite season? This has been a Finish the Sentence Friday post. The co-hosts this week are Kristi from Finding Ninee , Lisa from Flingo, and Allison from The Latchkey Mom. Sighing here. Can you hear me? I just said good bye to my 19 year-old son and my 21 year old girl leaves in two weeks. Soon It’ll just be me and the bunny and the dog. Ugh/Yay! We need to create a hold button, Katy. Can you get on that, please? Kelly l m kenzie recently posted…He Did What? Sigh right back at ya, Kelly, I think if Staples can make the Easy button, then they can make the Hold button, too! Katy – the leaves are already turning? Oh my! This week, our temperatures in the early morning dipped down to the low 60s (Atlanta), and I got nervous. I am NOT ready for fall. Not yet. Please. Ah, summer breeze.. makes me feel fine. We don’t have homework yet, or at least we haven’t, but this might be the first year with my oldest in first grade! Now I’m in the mood to watch Grease! Summer days, drifting away but oh those summer nights! Doesn’t that song just capture the magic of summer so perfectly? I guess it’s been an age-old dilemma, this whole bummed about going back to school thing! I’m really going to miss this summer as well! I do love fall and Halloween but this summer has been magical. With my son starting first grade in another week, I feel like I’m also saying goodbye to his babyhood, ya know? Sigh. At least we can drink wine in the fall and winter too! Thanks for linking up! My youngest will be in 3rd this year and I bet she’s going to look like an adult next to those kindergarteners. Sigh back at ya! 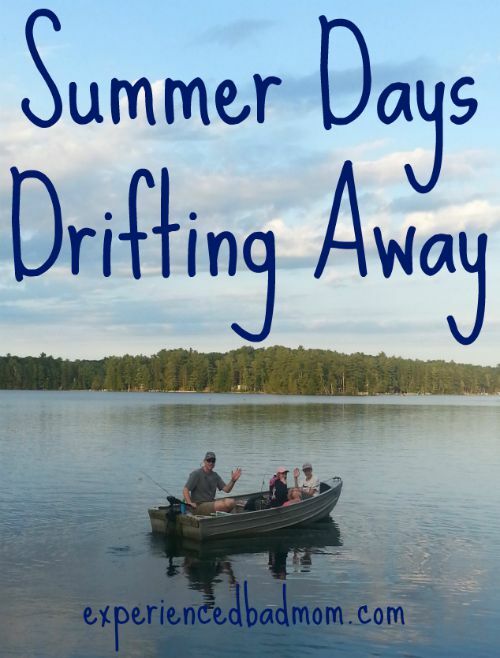 I so feel this Katy: “These kids were MINE all summer and now I have to share them.” For better or worse, summer throws us all together and that feeling of connection is fierce for those 10 or so weeks. Then off they go, back to school, with all of its routines and challenges and time away from us. A sigh from me too. we love fishing too. I want to get some more fishing in soon. I would love a boat like that too.. Even though your love for summer and all the things you’ll miss about it is so palpable, Katy, I love how you turn your attention toward the deliciousness of fall with optimism and enthusiasm! Well said! I could relate to so much! oh golly! your post made me skip a heart beat cause in a few years when my kid goes off to college…I will be dreading all this silence. I have to pause and hug and embed these memories in my old grey cells to help me live n relive these memories, huh!